Going on a trip to Iceland for 10 days and touring around the entire Ring Road sounds like a dream trip, and rightfully so! It IS a dream trip. We had been planning the trip for months, organized a great itinerary, booked the Airbnbs, and bought the tickets. It was all coming together and yet, in the back of my mind, I had a thought. "What if I didn't come home with all my gear?" Fast forward eight days and I'm watching my tripod, camera, lens and filter go over the second waterfall at Kirkjufellsoss on the Snæfellsnes Peninsula. Before leaving my house to go DIA, I took a photo of my photo backpack just in case my bag was stolen or got lost. However, I didn't take any photos of my gear that I had along on the trip. Thankfully, I had some great friends on the trip who took lots of pictures and some included my soon-to-be-destroyed gear. That has been the question I have been asked most frequently since returning. Everyone wanted to know and they all had their assumptions; wind, I bumped it, land gave way, or I dropped it. All are valid assumptions and cover the gambit of scenarios that could happen but unfortunately, none of those are the reason I don't have my gear anymore. 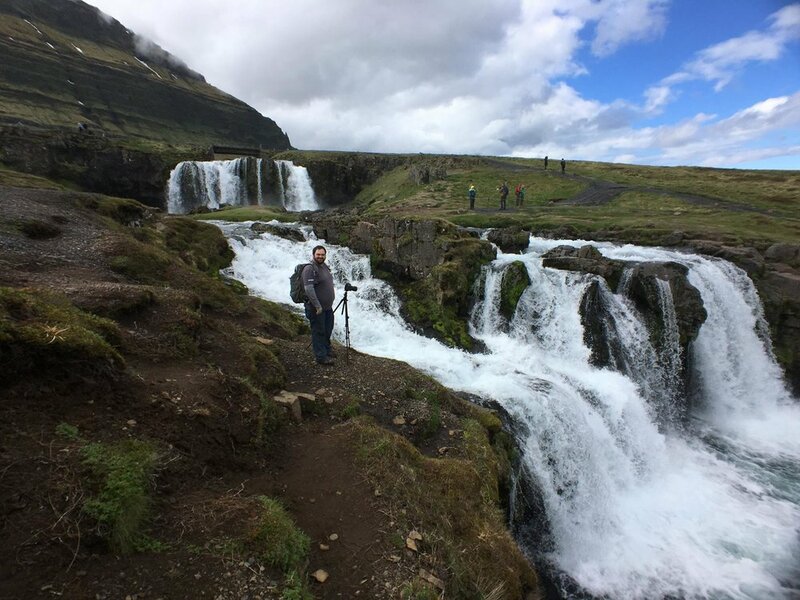 I set up my tripod in a somewhat precarious position next to the waterfall so I could get a beautiful vertical panorama of the falls and Kirkjufell mountain in the background. My friend Kate said "Ryan, smile! ", I looked at her and smiled. A few seconds later I saw her face drop and I heard a loud "CRACK" as if two rocks had just collided. I looked toward the waterfall and I saw my tripod go over the edge of the waterfall. I hadn't bumped it with my backpack, I hadn't pushed it or anything else. No gusts of wind, no earthquakes, nothing. It had simply fallen over. Me right after Kate said "Ryan, Smile! ", I had just taken a really good photo too! After more than 20 minutes of searching, jumping in the water, swimming, and walking up/down the stream, we gave up our search because we couldn't get close enough to the falls underwater without endangering ourselves. One of my friends on the trip got hypothermic due to the amount of time she spent in the glacial creek. This has been the second most asked question since I've returned from the trip. One of the factors that made this loss especially hard to swallow was that I had rented the lens that was attached to the camera when it disappeared. Because I turned down the charge to fully insure the lens when I rented it, I'm 100% liable for replacing the lens. I rented through LensRentals.com and I have been renting with them since 2008. I've never had anything like this happen and honestly, I never expected this to happen either. But, since they are in the service industry, I'm sure they have seen all sorts of strange stories about how gear has been lost. That is why I would recommend signing up for a damage plan when you rent your gear, LensRentals calls it "Lens Cap+" and if this were to happen again (knock on wood), I would only have been liable for 10% of the price of the lens. I'll be signing up for this next time I rent equipment from them. But how are you going to replace your camera equipment? And now for easily the hardest question and third most asked question, how am I going to replace my equipment? That is still a question mark actually. I've started a GoFundMe page and I've reached out to my insurance to file a claim, I have homeowner's insurance with covers loss of personal property so it's possible I'll get some insurance money from this ordeal. What I will be doing is insuring the rest of my photography equipment and I will STRONGLY recommend that everyone do this because you don't want to be faced with replacing gear without any aid coming your way. There are a few companies out there that specialize in this type of service and it's my understanding that you can add it to your current personal/business insurance too. All of that being said I still had an incredible trip and I wouldn't change much of it, good things came out of the trip and I'm already looking forward to the next adventure. I'll be in Telluride soon and then I'll be in SW Colorado taking photos in July. Hopefully near wildflower fields in July too and maybe some Ice Lakes Basin if I'm really lucky. Click here for the updated story!